TAMPA, Fla./MONT-TREMBLANT (Québec) – In advance of the Subaru IRONMAN® Mont-Tremblant presented by Sportium triathlon, local partners gathered for the inauguration of the Bird Observatory, which will be transformed into a bridge to become the official swim exit of the IRONMAN® events held biannually. The dedication was held in the presence of the Mayor of the City of Mont-Tremblant, Luc Brisebois, President and Chief Operating Officer of Station Mont Tremblant, Patrice Malo, President of the Ornithological Club of the Upper Laurentians, Michel Renaud, IRONMAN Foundation® Acting Executive Director, Sarah Hartmann, and IRONMAN Mont-Tremblant Producer and Race Director, Dominique Piché. Located at the corner of Chemin des Voyageurs and Chemin de la Chapelle, the Bird Observatory will benefit the entire community of Mont-Tremblant, as well as tourists, year-round by offering a new viewing opportunity, unique for bird lovers and wildlife and landscape enthusiasts. “This is called joining the useful to the pleasant, a gateway that meets the need for safety and accessibility for athletes and a bird observatory for our citizens. 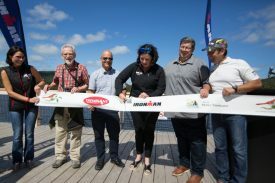 I warmly thank the IRONMAN Foundation for this precious legacy to the community,” said Luc Brisebois, Mayor, City of Mont-Tremblant. “This bridge adds to the many offerings put in place to optimize the experience of triathletes, as well as vacationers. It contributes to showcasing Tremblant’s wilderness environment while demonstrating our commitment to offer quality amenities that meet international standards for sports tourism,” said Patrice Malo, President and Chief Operating Officer, Mont Tremblant Resort. “We were looking to optimize the swim out on our IRONMAN course. This new development will be safer and better adapted to the caliber of our events, without forgetting that it will significantly reduce the distance between the exit of the swim and the transition zone, which will delight the participating athletes! I am proud that in this seventh edition, we continue to invest in the heart of our community, “said Dominique Piché, Race Director, IRONMAN Mont-Tremblant. Several species of ducks, including the Goldeneye and Crowned Harlequin, occupying the nest boxes in the nearby wetland.